Quotes on complex or higher quantity parts within a few hours. Our estimators and design engineers can work with you and your 2D files (such as .dxf, .pdf, .slddrw, .jpg, .dwg, .tif, .png) or hand drawings to provide you a rapid quote, so you can keep innovating. Get quality parts at the best possible price. 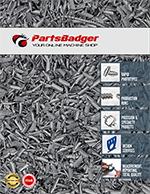 Use the Parts-Badger Price Calculator for instant pricing on your parts. Get your parts Fast! Order today and get your parts in as little as 7 days with our Quick-Ship service. Get your 3D printed parts in production quality aluminum with our fast and affordable maker service. We accept your da Vinci, Cube, Makerbot or ultimaker 3D .STL files. Need reverse engineering, design services, or just want to work with a design engineer one-on-one? Contact Us Now! Fixed prices are available right online! Upload your design, see your price, and get your parts in as little as 5 days. Your order confirmation will be in your email inbox within a few hours and your parts will enter production. You will also receive a tracking number to the email address you provide so you can keep an eye on when your shipment will arrive to you! Instant quoting of your machined parts is a breeze. Online ordering speeds up your order by 2-days versus the ‘other guys’. Our standard production parts arrive in the same amount of time as the ‘other guys’ expedited services. Why pay more for expedited processes when we do it in the same amount of time for less money? PartsBadger is one of the lowest cost machined parts providers in the world. Why? Because a simplified process means lower costs for our customers. Who doesn’t like lower costs for high quality products? Easy, Fast, and Affordable. These are core ideas that drive every person here at PartsBadger. Based in Milwaukee, WI, PartsBadger can have your machined parts shipped quick to meet your schedule. Instant Quotes set PartsBadger apart from other parts suppliers. We want you to know up front what your project or prototype will cost. Being able to give a quote up front, saves you time and simplifies the machined parts ordering process. Ready to get started on your Instant Quote?